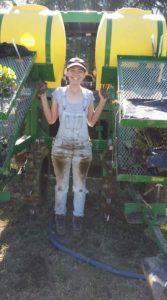 If you ever want to get your pants, or rather, almost your whole body, dirty; transplanting sweet potatoes will surely get the job done. The task seems easy: just sit in a little chair being towed by a tractor and stuff the transplant slip in the ground and burry it. No problem, right? Well not exactly. This is a perfect example of something being easier said than done. The tractor may only be going at .4 miles an hour but it feels so much faster. On top of that, the person sitting on the right side of the rig is in control of the water valve that flows through the puncture wheels that will make the little mud holes into the rows each being separated by a foot of space. There is a rhythm to transplanting. The way the slips are in your lap, how you transfer the slips from one hand to another, how you place and burry the slips…it seems like an easy process but you really have to concentrate while doing it all. 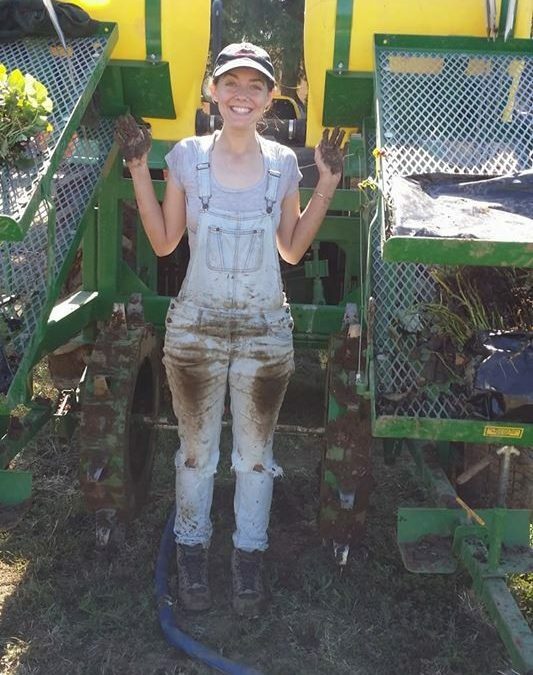 The task is dirty, but it was probably one of the most rewarding things I have done on this farm. My hands were scraped up from the clumped-up dirt, my overalls needed to be heavily washed and my back hurt from bending over to plant the slips. But it was productive and I enjoyed learning the process. We all rotated sides and driving and it was a joint effort to get the field done in a timely manner. Altogether, the hours it took to transplant the multiple varieties of sweet potatoes were tiresome, but it was entertaining. Sometimes when any of us were messing up or the little moments when we were being silly brightened up the mood because we were there for each other. It was my first time ever doing anything like this and I think I stayed on top of it well. It was its own bonding experience, too.